The Senate voted Thursday to confirm Thomas Perez as labor secretary, ending a nomination battle that had brought national attention to an otherwise obscure civil rights case involving the city of St. Paul. The 54-to-46 party line vote came after senators reached a deal to avert a GOP filibuster, which had otherwise seemed likely given fierce Republican opposition to President Obama’s labor nomination. 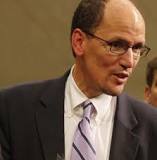 As we’ve noted here before, conservatives in Congress had accused Perez, currently the Assistant Secretary for Civil Rights at the Justice Department, of having bargained away a case accusing St. Paul officials of improperly using federal housing funds in exchange for the city’s decision to drop a housing discrimination case that could theoretically have wreaked havoc with federal civil rights law. The same tangled legal web also has been used by Senate Republicans opposing the nomination of Minnesota U.S. attorney B. Todd Jones, as permanent director of the federal Bureau of Alcohol, Tobacco, Firearms and Explosives. Jones’ nomination is not part of the no-filibuster deal, but Minnesota Democrats such as Sen. Amy Klobuchar are holding out hope that the goodwill from the agreement could help with the Jones nomination as well.